Landscape maintenance and lawn care services can be a rather expensive business. Hiring professionals to come out regularly can consume a large amount of your gardening budget that you might just not have or want to spend. You may want to look into making a one-time investment in an alternative to real grass. Artificial grass, also known as synthetic turf, is an acceptable substitute for a real lawn. It will give your home or business the look and feel of having an actual garden, but you will not have to pay exorbitant fees or carry out the hard work to maintain it. At first sight, no one will be able to tell that you have artificial turf. Our synthetic grass is so neat and clean and green that most people will just go on thinking that it’s the real thing, thanks to our amazing and exclusive contract with ‘Wonderlawn’. Maintaining an artificial lawn is a lot easier and a great deal less expensive than doing the same thing for real grass. Artificial grass lasts for a long time and it will be years before you will have to think about a replacement. The trouble with real grass is not only that it grows and has to be cut, but that the traffic of people walking or running across it inevitably ruins it. Even if you post signs to stay off the grass, you will find people walking on it and doing other things that degrade it. 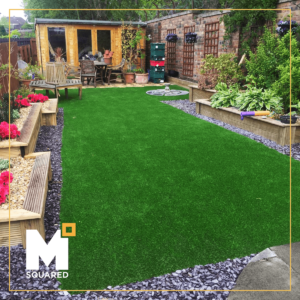 Our Glasgow based Artificial Grass installation service offers the whole package from the initial design and grass structure to the timely installation. We’ll even remove any debris that happens as a result of the swap so that you don’t have to worry about anything. We’ve done this so many times before, without failure. What are you waiting for? Take the next step and give us a call for a chat about making your garden great again!